For years, Fantasy Flight Games has pioneered the advent of tabletop games into the digital age with entries ranging from app-integrated board games like XCOM: The Board Game and Mansions of Madness Second Edition to standalone digital translations of tabletop games, such as Elder Sign: Omens and BattleLore: Command. Today, Fantasy Flight Games is excited to announce a new partner in bringing tabletop games to the digital world: an entirely new development studio named Fantasy Flight Interactive. Focused on not just adapting tabletop games, but creating fresh digital experiences based on Fantasy Flight Games’s most-beloved brands, Fantasy Flight Interactive has projects already in the works for Steam (and other platforms to follow). Fantasy Flight Games will continue to create hybrid digital board games, such as Mansions of Madness Second Edition. “We didn't create a new company just to translate board games into digital games. We're focused on the bigger picture of the experiences our fans can have on new platforms, and this will take our brands in new directions,” said Christian T. Petersen, Founder of Fantasy Flight Games and CEO of Asmodee North America. 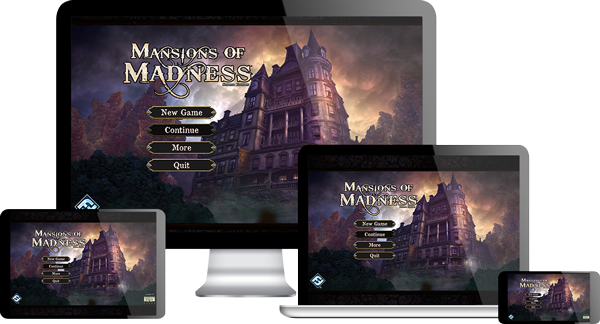 As before, the designers and developers at Fantasy Flight Games will continue to create hybrid digital board games (like the aforementioned Mansions of Madness Second Edition), while Fantasy Flight Interactive turns its focus to more expansive video game projects. Fans can anticipate richly strategic experiences with easy-to-understand UI that maintain the core philosophies of Fantasy Flight Games—smartly designed, carefully curated play experiences, adapted for digital gaming with the same emphasis on fun, balance and polish. The Fantasy Flight Interactive team is headed by video game industry veteran Tim Gerritsen, who combines a wealth of both board game and digital gaming expertise to bring the best of both worlds to players and his studio. Gerritsen has over twenty-five years of experience working on video games like BioShock Infinite, Prey, and Rune, as the former Studio Director of Irrational Games, and CEO of Human Head Studios. The Fantasy Flight Interactive studio is based out of Madison, Wisconsin. For more information on the first projects coming soon from FFI, keep an eye on our website or the FFI website here! Fantasy Flight Interactive is a new digital games studio, based out of Madison, Wisconsin. They are dedicated to bringing Fantasy Flight Games's most-beloved brands to the digital realm as fresh new experiences.